For some reason there’s nothing more interesting at that age. Fascinating! Better than what’s on TV!! Who needs a TV! Wish it lasted longer sometimes! I can understand this – I currently have a fascination for watching the sprinkler in the garden. Was there a special toy in their? Hahaha We watched that film last week! So far, my favorite Silent Sunday post. Cheaper than Sky! Very funny. Does that count as screen time ? I couldn’t work out what this was at first!!! looked like a train or something!! lol! that is a good one to have for when they are older. i love the pic at the head of your blog too. did you take it? 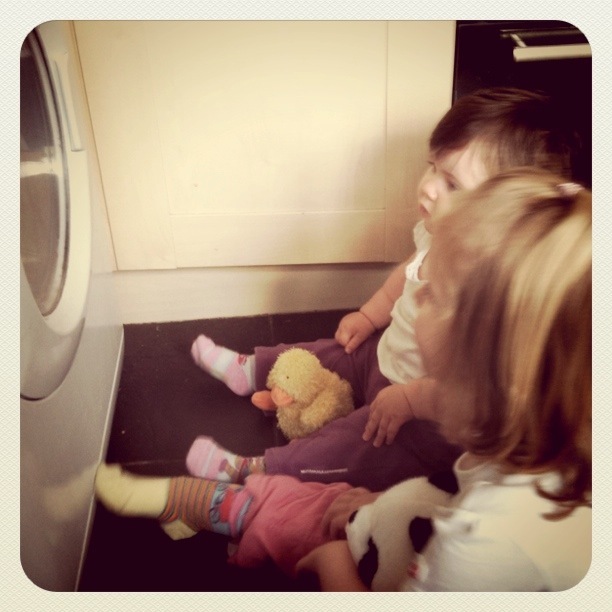 Washing machines are fascinating for little ones aren’t they? Glad to see they had their teddies with them and that they weren’t watching them in the machine, always used to make me really upset when I was a nipper. Nothing better then watching the washing machine!